I made lots and lots of pillows. They were my greatest achievement in the sewing department. You took two pieces of cloth, sewed them together on all sides -- leaving a small opening for cotton stuffing -- turned them inside out, stuffed, and then had someone with better stitching skills close for you. I dabbled in hook rugs -- took me three years to finish a blue 8x8 cat -- and took a few passes at knitting before it was cool. (Believe me, it was not cool to lug a grandma handbag with needles and yarn around the 6th grade, especially since a scarf was the only thing I produced. And even that is still on the needles.) I giggled too much at the name to give crocheting a serious shake, and needlepoint, which looked beautiful and impressive, was actually tedious and necessitated blood transfusions. So, while I inherited my grandmother Clemmons' love of cooking, I did not get her talent with the needle. That particular gift stopped with my mother who churned out beautiful Christmas stockings, Halloween costumes, lavender-filled drawer sachets, and Cabbage Patch Kid clothes. In our teenage years, my mother would use her sewing machine to alter jeans as dictated by my sister's fashion sense. (Come to think of it, Jennie would also later turn pajamas my dad didn't know he was done wearing into skirts, so maybe she got the stitchery gene.) And in 1977*, Grandma Clemmons made us Easter dresses. Hunting Easter eggs in Minnesota is usually an inside affair. While we were supposed to be praying for all things Easter-y at Westminster Presbyterian -- ham, purple pulpit ribbons, and big hats in the congregation -- my sister and I were praying that the foot of snow in our backyard would have melted by the time we got home. Amazingly, we rarely had that prayer answered, so the Easter Bunny hid colorful plastic eggs around the house. Eggs replaced light bulbs under lampshades, peeked out of the fireplace grate, hung out on top of books, rolled on piano keys, got stuffed under sofa cushions, and brazened it out on the carpeted stairs. One year the Easter Bunny replaced every bulb in the brass chandelier with eggs. The hard boiled eggs we had dyed earlier in the week would be hidden too, but since they didn't release pastel M&Ms or shining spills of pink and green jelly beans when cracked open, they were less exciting to find. Clearly, not the highlight of Easter -- our interest in them lasted as long as it took to dye them -- the hard boiled eggs would eventually, begrudgingly get eaten. Sort of. We would take them to the top level of the playhouse my dad built, shell and salt them, eat the whites, and then throw the yolks against the trunk of our neighbor's tree. Where they stuck longer than you would think cooked egg yolks could stick. Sometimes my parents lost track of all the eggs they had hidden, which meant one of two things: awesome discovery of unexpected candy wealth, and less awesome discovery of rotted-out-thing-formerly-known-as-egg. But before we could hunt for eggs, we had to get through church. And in order to get through church, we had to get dressed in our Easter dresses. And on our first Easter in Minnesota, we discovered that Grandma Clemmons had requisitioned all the eyelet in the state of Washington for our multi-layered dresses and matching parasols. If you look at the photo, you can see that while I'm standing stiffly with my feet close together, my six-year-old sister -- who has artistically augmented her outfit with a white shawl casually draped around her shoulders -- adopts a more professional photographic pose with one foot forward. By the way, that house in the background: not ours. It's a house on an entirely different block. See, not content to have us pose in our yard of our own house (which we did), or inside our own house (which we did), or at our own church (which we did), my mother had us parade around the neighborhood with our eyelet-shrouded parasols open to block out the overcast Minnesota sky. 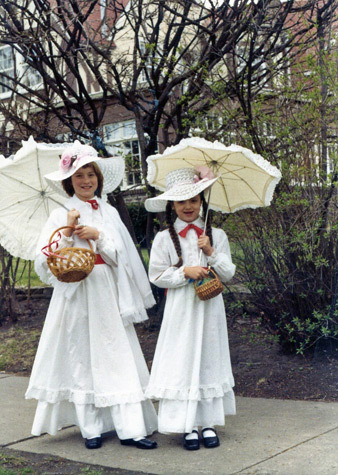 That photo is all about the Vander Weide girls making a sensation around the neighborhood -- a neighborhood, I might add, where no one else was marching around in their Easter dresses, much less doing it with flowery hats, baskets AND parasols. It's lucky for us there wasn't snow that Easter, because it wouldn't have stopped my mother's photo op, and we would have looked even crazier to our new neighbors who were already suspicious about our East Coast origins. In the Easters that followed the Eyelet Easter, my sister and I were allowed to pick out our own Easter dresses. I remember thinking I looked particularly fetching in a dropped-waist floral number. It was also was the same year I insisted on wearing a hat with a mini veil to church, so...yeah. This year, I've got Bug's Easter outfit all picked out. It comes from a little seamstress called the Gap, so he won't be as exotic as Jennie and I were -- although don't put ideas in my mom's head. Given half a chance, she'll turn him into Little Lord Fauntleroy -- but he'll be festive. He (or I) will carry a brand new Peter Rabbit basket with his name stitched on it. He (or I) will hunt for eggs. I (not he) will eat the candy. And, yes, I will probably make him parade around the neighborhood. *TIME CORRECTION: My mom emailed to say she was "a few years off" on that photo, which was taken in 1980. So, I was seven, my fashionable sister was ten, and it wasn't our first Easter in Minnesota. In fact, what with all the seances, our neighbors were very well acquainted with our holiday spirit by then.